PRESS RELEASE: Does Colorado West Slope “Manifesto” Kill The Windy Gap Firming Project? Does Colorado West Slope “Manifesto” Kill The Windy Gap Firming Project? Northern Colorado: Over the last few days, a picture of the future “Climate Change Water Wars” has played out in Colorado, and the proposed Colorado River dam/diversion called the “Windy Gap Firming Project” is dead in the crosshairs of the war. As described in the Grand Junction Sentinel (see link here) and more deeply in Aspen Journalism (see link here), the West Slope stakeholders in Colorado have issued an ultimatum to the Front Range Denver Megalopolis growth machine. The ultimatum, described in the West Slope “Manifesto”, states that when there are cuts or curtailment to Colorado River water diversions due to drought and the “Drought Contingency Plan”, that the Front Range must share the cuts. At the center of the entire mess sits the proposed “Windy Gap Firming Project”, which hasn’t even been built yet, but would divert a new ~9 billion gallons of water/year (30,000 acre feet) directly out of the headwaters of the Colorado River in Grand County, Colorado, to pipe under the continental divide over to the Front Range. Further, the project’s water right is extremely junior — dating to 1980 — signaling that its water would be one of the first curtailed when the likely inevitable cuts occur. Save The Colorado has led a legal fight that has stopped the project in its tracks, including a lawsuit as well as an official delay announced by the project applicant. In its lawsuit against the project, Save The Colorado and co-plaintiffs had already made the claim that the project’s extreme junior water right meant that it would be one of the first to be cut if a curtailment were to occur, and now the West Slope “Manifesto” amplifies that claim. “The Windy Gap Firming Project should be abandoned as soon as possible — it accelerates the risk of a curtailment and accelerates the risk to every ratepayer and water user in northern Colorado,” continued Wockner. This press release is posted here. Colorado River Update: The Good, The Bad, The Ugly! 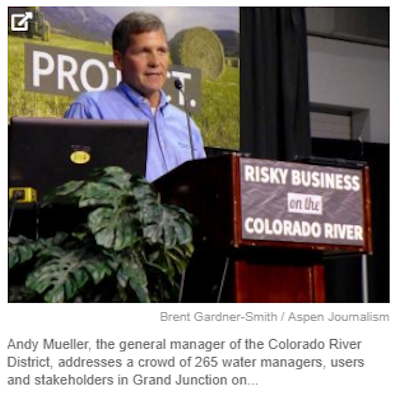 PRESS RELEASE: River Destruction On Tap At The Colorado Legislature?